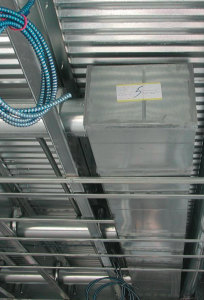 Understand cold-formed steel joist products, and then pre-plan to avoid clashes in the trades and create efficiencies in your construction project. Why should contractors build virtually before erecting anything physically on the job site? Because upfront planning with other trades can creative a positive environment for the contracting team, speed up workflow, cut costs and trim man-hours required to complete projects. Collaborative meetings utilizing Building Information Modeling (BIM) can resolve problems before they occur. This is true when using all building materials, including cold-formed steel (CFS) floor assemblies. First, let’s talk about the state of today’s CFS joist products. Then, we’ll dive into how to get the most out of coordinating among the trades. It used to be that to build a floor with traditional C-studs, studs were turned on edge and braced with web stiffeners. You needed stiffeners to carry lateral loads along a horizontal plane. Not only were there lots of parts and pieces, but you also needed a lot of labor to erect the floor assemblies. All that has changed with the introduction of stiff, proprietary joist products fabricated with large knockouts — holes large enough to run standard-size plumbing and ductwork. New, proprietary CFS joists are stiff. They require fewer bridging bars, lateral blocking, joist hangers and web bracing than traditional C-studs. Less material means less space is needed on the job site. And, generally, fewer crew members are needed to install the systems. The general contractor calls the kick-off meeting, making sure to give everyone plenty of advance notice so final decisions can be implemented. The architect coordinates the HVAC system’s design and location along with the mechanical and CFS engineers. In turn, the MEP trades coordinate with the CFS engineer and the framing contractor. They should discuss the location of toilet traps, mechanical returns and main trunk locations, any special knockout diameters they need within floor joists, etc. In designing the structural steel system, the CFS engineer coordinates knockout alignments of the floor joists, as well as the locations of in-floor girders. A good framing design helps the MEP trades have proper access to and placement of their systems. Working with the other trades, the framing contractor tries to stage its work efficiently and generate less material waste, which enables all trades to run with leaner crews. The framing contractor’s upfront coordination ensures proper knockout alignments. And, he can see potential field conflicts and alert others early. BIM is a significant improvement to the old method of clash detection with trades. The BIM modeler’s work helps keep MEP systems within the plane of the floor assembly. This eliminates unnecessary and costly bulkhead and drop-ceiling framing conditions and increases the overall efficiency of the construction process. Here’s an example of a successful mechanical system installation done with proper planning prior to the project start. Mechanical system, floor joists and deck aligned and optimized through pre-planning meetings held upfront by the GC, architect, and the trades. Clearly, projects that plan upfront and use proprietary CFS joists are successful. Pre-planning helps the trades avoid potential clashes, saving time, labor and money. Top photo is a nice project in DC, Frameco Panels and Hambro joists. CFSEI award winner for the cold-formed work Excel Engineering did. Check out January’s article in Structure magazine to learn more. ClarkDietrich Building Systems, formed in 2011 through the combination of two established market leaders – ClarkWestern Building Systems and Dietrich Metal Framing – offers a broad range of steel construction products and services across the nation and abroad. Using cold-formed steel, ClarkDietrich manufactures innovative products for interior framing, interior finishing, exterior framing, floor and roof framing, as well as clips, connectors, metal lath, barrier mesh and accessories. Creating partnerships with teams of architects, engineers, building developers, and contractors, ClarkDietrich uses cold-formed steel to bring change to the built environment.